We took over the maintenance of the existing version in 2015 and then worked on two larger versions which were released in 2016 and 2017. Because they want to watch ARTE when, where and how they want to. 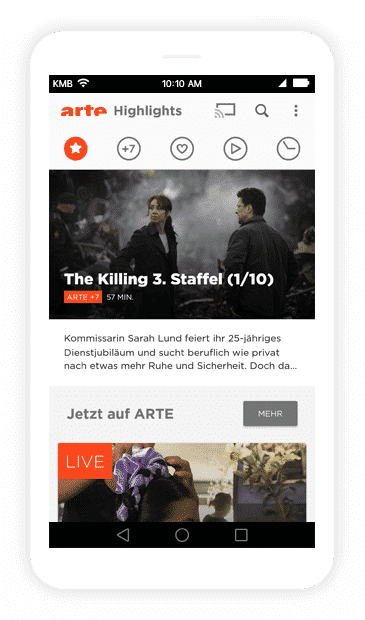 The ARTE media library app is the central mobile access point to all programs of the German-French channel. 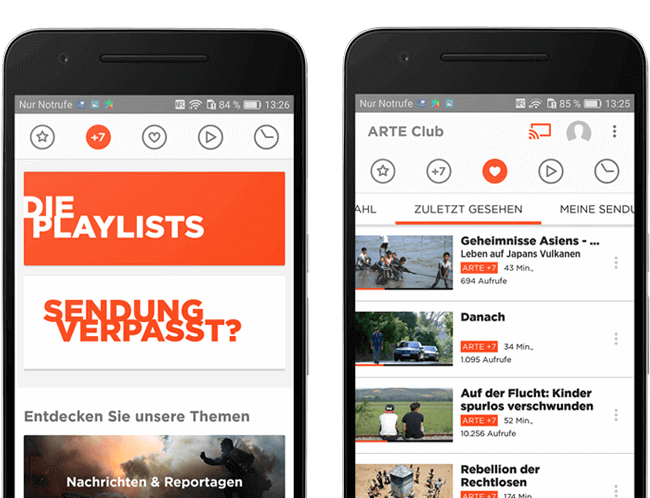 The heart of the app is the media library (with ARTE this is available under the name +7), in which current programs from TV are put together with special online formats. As well as this, the app offers a curated highlights page, the schedule for the coming days and a wealth of additional information for all formats. The personalised area of the ARTE Club connects the user with all online offers—for example marking programs in the media library to watch later. The challenges of supporting such a complex project begin with the particularities of a German-French TV channel. The handling of languages and a large library with extremely diverse content is connected with video streaming, Chromecast and a highly complex tracking system which needs to for example calculate the number of viewers. 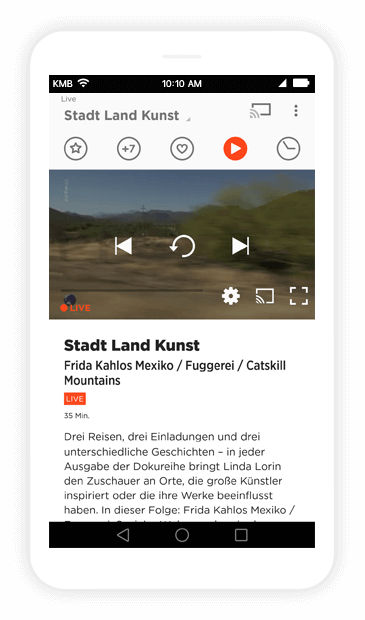 As well as this, the app should continually develop, and not be there simply for passive consumption, but to actively bring the user into the world of ARTE and all the offerings of the channel. 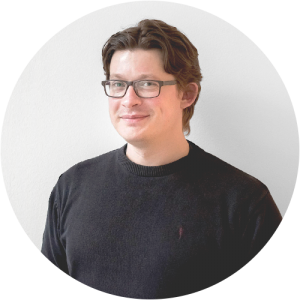 We worked on the app for two years, and during this time our task developed from simple maintenance to a complex redesign and a European version of the app. What was especially important with how we approached the project was an appropriately multilayered processing of single steps: we further developed the tests for the application, isolated components, and only then developed them further. An example: Through the expansion of available programs a new navigational structure became necessary, without an adaptation of single inputs. Our work here focused especially on taking the user through to where he wanted to go. 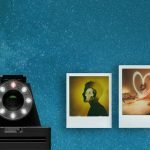 Generally, we worked on this project in such a way that we left the decision to the client, to release these single steps, or to wait and bundle them into a new, larger version. An early step in the project was the reconfiguring of the TV schedule into the new API, which goes by the name of OPA (Open Program API) – which also involved eliminating the code for its predecessor: PAPI (Program API). In German this sounds a little like the strange story of Benjamin Button, although in actual fact it had more to do with JSON data. Alongside the automated tests for the data classes and their evaluation, I also needed to look manually through all the entries in the programming scheme. Through this time, you could have woken me up at 3AM and asked me what ARTE would show in the afternoon of any given day in the next two weeks.